During the first week of January, Hardtalk will be taking a closer look at Business. 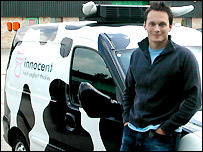 Today Jenny Scott meets Richard Reed of innocent drinks. They've been called quirky and "annoyingly perky" - but London-based drinks company, Innocent, are impressing analysts with their ability to win customers over with an environmentally - friendly business image. After 8 years the company - started by three college friends - is doubling its profits annually. Richard Reed is one of the founders of Innocent - can his company continue to grow - AND maintain its green credentials? It can also be seen on BBC News 24 at 0430 2330 and 0230.